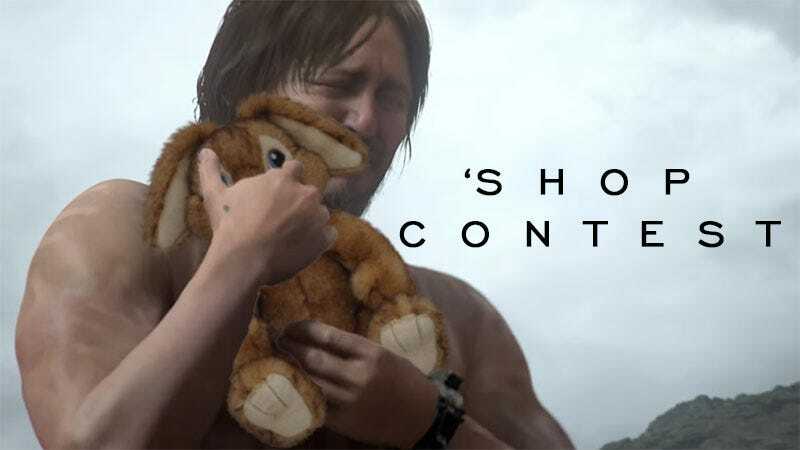 If you hadn’t already figured that this week’s ‘Shop Contest would somehow involve naked Norman Reedus from Hideo Kojima’s newly-announced Death Stranding, welcome to Kotaku. Update 6/22/16 — We’ve still got three days left to tuck things into Norman’s loving arms. It was really this or Dad Kratos, and we used Dad Kratos for our Father’s Day post. So here we arm, putting things into the loving arms of a crying naked man. We’re riffing on a meme that’s been making the rounds since Sony announced the new game, which from what I can determine is about an oil spill on acid. It’s pretty simple. Just replace this baby with something else. Preferably something funny or poignant. Build-a-Bear bunny is already taken. Everything else is fair game. Entries are due by Saturday morning, after which point winners will be held up by a naked crying man on a beach. Or we’ll just post and praise them. Probably that second one.